Plot: Arthur Curry learns that he is the heir to the underwater kingdom of Atlantis, and must step forward to lead his people and to be a hero to the world. Starring: Jason Momoa, Amber Heard, Dolph Lundgren, Nicole Kidman. 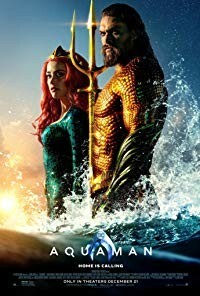 distributed by Warner Bros. «Aquaman» in the US movie theaters released on December 21, 2018 and has grossed over $1,1 billion worldwide; dvd and blu-ray release date was set for March 26, 2019. Rent from Netflix and Redbox from March 26, 2019. «Aquaman» in the UK released in movie theaters on December 14, 2018. The movie released on dvd and blu-ray on April 8, 2019.